The background has been stamped with some new PaperArtsy stamps fresh from the mail. 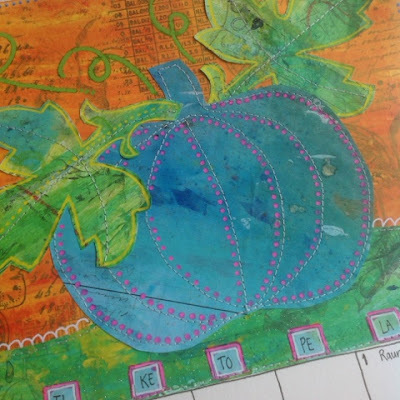 I painted over the stamping in orange and used a stencil to help cut out the leaves from green underpaper. 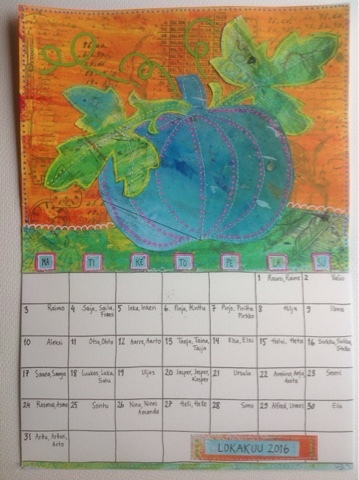 I've been trying to use weird colour combinations for this calendar, so the pumpkin ended up blue. I guess I should have cut the leaves from purple paper, they would have stood out more, but this is the way it ended up. Some sewing and doodling... and I'm calling it done! The calendar grid has been drawn by hand in Finnish style with weeks running from Monday to Sunday and specific names noted for each day. Wow gorgeous colour combinations. I think the blue with green leaves works well. I love your blue pumpkin! A great collaged page. Wow this is so bright and cheerful!! Lovely colours! 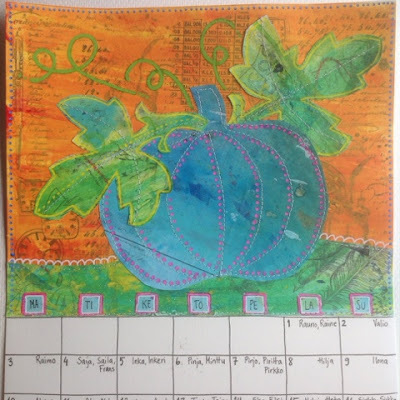 Thank you for joining in The Craft Barn Calendar Challenge.